Nancy Olson and I loved Adam Haslett's story collection, We Are Not Strangers Here. 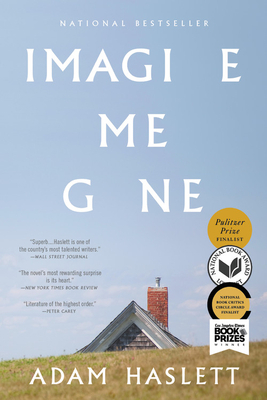 His new book, a novel entitled Imagine Me Gone, incorporates the same exquisite writing and intriguing characterization. He has created a beautiful story of a family haunted by mental illness. Early in the book, the father commits suicide to escape his demons, and the family is left to pick up the pieces. The oldest son suffers from the same demons, the youngest son is the peace-maker of the family, and the daughter struggles with balancing the needs of the family with a troubled but safe relationship. There is a Christmas scene that makes me think Haslett was eavesdropping in my living room this year! The characters are so vibrant and their situations so moving that I continue to think of them now that I've read the book to its compelling ending. Haslett has been a Pulitzer and National Book Award Finalist; I predict this will make top ten lists for 2016.